This is the third book in the Violet Eden Series, and let me tell you… I want book 4 like yesterday! 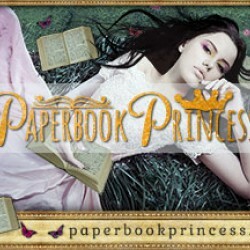 I love all books that involve the supernatural, and well this book has that in abundance! If you haven’t read the first two books you are totally missing out. 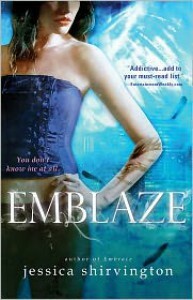 Emblaze is able to provide so many twists that there is no way to know what will happen next. It is also jam packed with action and the love triangle that Violet has going on? It’s pretty intense! Violet is a favorite character of mine because she is just so real… sure she’s not totally human but well, we can overlook that fact right? She is sarcastic, and witty, and she really doesn’t take crap from anyone… she is just a very strong female character. Lincoln is 1 part of the love triangle mix… I have been a big fan of his since the beginning, and although so much always seems to happen… I am really starting to lose hope for him and Violet… and to be honest; I may have a slight soft spot for Pheonix. Ahhh, Pheonix… he is the bad boy, although he is really like the ‘bad guy’ that everyone wants to kill, but that’s besides the point… every book I like him just a little bit more. I think he seriously loves Violet, and I think everything he has done thus far is because of and for her… I hope that in the forth book he realizes that he doesn’t have to be the bad guy… ok, maybe wishful thinking right? I mean there HAS to be a bad guy and well sadly Pheonix fits the bill.This book… no wait this whole series… is perfect for you if you like a angels, myths, action, and of course romance.